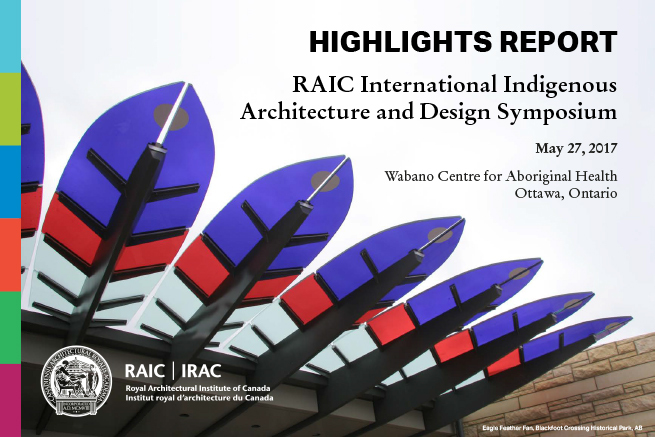 OTTAWA, November 29, 2018 – Royal Architectural Institute of Canada (RAIC) is pleased to announce that the Highlights Report of the first RAIC International Indigenous Architecture and Design Symposium is now available for download. The symposium took place on May 27, 2017, at the Wabano Centre for Aboriginal Health in Ottawa, ON in conjunction with the RAIC annual Festival of Architecture. It was the first project undertaken by the RAIC Indigenous Task Force, whose purpose is to foster and promote Indigenous design and architecture in Canada in rural, Métis and Northern communities, First Nations and urban spaces and to advocate with and on behalf Indigenous communities. The symposium’s theme was Reconciliation, Place-Making, and Identity. The feeling of optimism, energy, and momentum at the symposium inspired members of the RAIC’s Indigenous Task Force, led by Douglas Cardinal, FRAIC, to submit a successful proposal to the Canada Council for the Arts to represent Canada at the 2018 Venice Biennale in Architecture. Their project, titled UNCEDED: Voices of the Land, was on public display from May 26 - November 25, 2018, at the international exhibition. The Royal Architectural Institute of Canada (RAIC) has operated continuously since 1907 as the national voice for architects and architecture in Canada. Its mission is to advocate for excellence in the built environment, demonstrate how design enhances the quality of life, champion sustainability, and promote responsible architecture in addressing important issues of society.